When you're late, you're just late. Many thanks to Sonia of In Pursuit of Style for reminding me to look up Atlantic - Pacific. 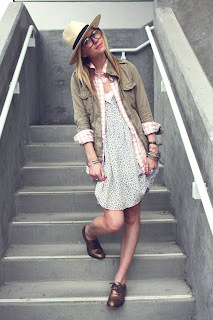 I am a newly converted lover of this simple, chic and totally inspiring personal style blog. She has great taste and an aspirational-meets-obtainable mix of high and low style. I dare you to check out Atlantic - Pacific, and not accidentally fritter away half your work day ogling her outfits. I love Atlantic-Pacific!!! Her outfits make me so happy.